So far it’s been Tokyo, Tokyo, Tokyo on the Coffee Spot, but yesterday I escaped the heat of the city (as an aside, it’s currently Japan’s hottest ever heatwave, with Tokyo reaching a sweltering 38⁰C) for the relatively cool (~30⁰C) of the mountains of eastern Nagano Prefecture, just under a 1½ hour ride on the bullet train northwest of the capital. Here I met up with Christopher, an American who has lived in the area for around 30 years. The plan was to go hiking in the mountains, but along the way, Christopher took me to the delightful & Espresso in Tomi, an area best known as the home of Maruyama Coffee, which has its roastery in nearby Komoro. Midway between Ueda and Karuizawa, & Espresso is easy enough to get to by local train, being a few minutes’ from Tanaka station. & Espresso is the brainchild of owner and head barista, Harasawa Masanao. Opening earlier this year, it’s in a converted rice storehouse at the rear of a small parking lot, so it’s easy enough to miss. 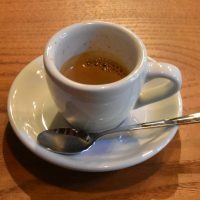 The coffee is from Kagoshima’s Voila, with a choice of two single-origins available on espresso, either black, or in a variety of milk-based options.